If you notice loose round holes in dry, damp, soft or unfinished woods in your deck or outdoor furniture, there is a good chance that carpenter bees have infested your house. Aside from the queens of bumble bee hives, carpenter bees are the largest breed of bee native to the United States. Carpenter bees do not eat the wood, but they do make nesting areas in it. The bees themselves are not particularly aggressive, but they can severely damage your patio, garden furniture and decks or gazebos. Even though this breed of bees is not known to be aggressive, some male carpenter bees do become aggressive if there is sudden movement that they perceive as a threat. In cases like this, they may sting. There are several types of products available for bees, but they almost all contain dangerous chemicals that also pollute the environment. So when you’re determining how to get rid of carpenter bees, why not choose a non-toxic alternative? These home remedies will keep the bees at bay without harming the Earth or the air. This remedy works especially well if you don’t like the negative effects of insecticides. If you can close off the entries and exits, this may be effective in getting rid of the bees. Use steel wool to plug the holes, since they can’t dig through it. You could also use putty or caulk, but use a lot – bees can get through a thin layer. Work on blocking the holes at NIGHT, since adult bees forage during the day. This idea sounds a little strange, but it really works! Carpenter bees cannot tolerate any loud noise, so make as much as you want. Let the neighbors know what you’re doing first. Use a sound box or boom box close to the usual bee locations. This encourages them to leave. Noise is a hassle-free, chemical-free way to keep bees at bay. You can use a small attachment of the vacuum cleaner to get rid of carpenter bees in the wood. Plug any openings you’re not vacuuming, so they can’t escape. Use a strong vacuum with lots of suction. A new vacuum works better than older models. Do this work during the evening, since the bees will be “home” and not able to leave quickly. Spraying gas or diesel duel into the burrows in the wood will kill the bees inside. This isn’t a totally environmentally friendly way to get rid of the bees, but it’s usually effective. Fuel is flammable, obviously, and it can harm skin, so use it with caution. Wear goggles, a respirator and gloves while you squirt gas into the bee burrows. If you use a conventional spray bottle, safely dispose of it when you’re done. If you are planning to paint or side your house soon, consider having your house done with vinyl siding. This type of siding has no wood on the surface, and carpenter bees cannot damage it. Use 2-liter empty soda bottles to make bee traps for your yard. It’s a natural and safe way to get rid of those pesky bees. If your bees have a hive somewhere in your wood, this won’t work. But it will reduce the bee population, even though it’s not killing anywhere near all the bees in your yard. Cut off the conical bottle part and turn it on the end, creating a funnel. Staple it in place. Fill your bottle with several inches of soda or juice, and then hang that bottle in your garden or yard. Many bees will find their way inside, but they won’t find a way out. 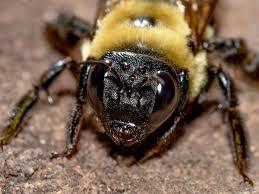 When you spray carburetor cleaner on carpenter bees themselves, it will help to get rid of them. It isn’t gentle by any means, but it’s quite effective. You can purchase various types of carburetor cleaner. Some will kill bees instantly and others simply make the burrows uninhabitable for them. After you spray burrows, close the entrance holes to the burrow, so the remaining bees will die inside and so that burrow will not be used again. Note: Be sure to keep the spray away from your face and eyes. Read all precautions and wear safety goggles, etc. to protect yourself. In the spring, carpenter bees are actively searching for burrows, so they can lay their eggs or feed larvae. So, they’re quite active during this time, for two or three weeks. Use badminton or tennis rackets to smash them. After you hit them hard enough to knock them to the ground, you need to step on them with hard soled shoes, to kill them. Almond essence or almond oil is useful in repelling, but not killing, carpenter bees. You can squirt citrus sprays in areas that become infested with carpenter bees. Find one made specifically for this type of bee. You can make your own citrus spray at home, too. Take citrus fruits like limes, grapefruits, oranges or lemons and allow a couple to boil in a pan of water. The water should completely cover the fruit. Next, fill a spray bottle and fill it with your newly-made citrus spray. Spray it on the holes made by carpenter bees. Citrus oil is effective for many other insects, too. They naturally abhor citrus oil. When carpenter bees clear out holes in your wood, they’re not eating the wood itself – they’re just making tunnels as shelter for their young. It’s easy for them to excavate wood that has not been painted, like railings, wood shingles, roof eaves, windows and doors. When you paint the outside wooden surfaces of your home, it makes it easier to reduce your bee infestation. The bees may attack any wooden surface, but experts believe they burrow into untreated wood first. Use good quality exterior primer and do two coats for additional protection. Oil based paints work well to keep carpenter bees away. Wearing gloves, fill the bee burrows with diatomaceous earth. It will kill the bees and dry the nest out. After that, close the holes using putty or something else that they can’t burrow through. Be sure that the gloves you’re using for this task are not used for anything else. Throw them out or mark them in some way and keep them ready for next time you need them for this purpose. Clean your hands well using soap & water when you’re done. Using hardwood prevents carpenter bees from building nests, because it’s not as soft as the woods they usually burrow. Maple, cherry, ash and oak are popular hardwoods. Make new lawn furniture from one of these woods. This flower is also called Tanacetum, and it has a natural insecticidal property. Its spray will kill your carpenter bees. Wear a respirator, goggles, protecting clothing and gloves to avoid stings and insecticide dust. Mix tea tree oil, citronella oil, jojoba oil and lavender oil. Once they are mixed, pour the solution into a spray bottle. Spray it on any areas where you want the carpenter bees to leave. Each of these oils has properties of good insect repellents. Place beer cans that are between 1/4 and 1/2 full away from the area where you want to relax or have a BBQ. They should be 10 feet or more away from people. Hang the beer cans from fencing or leave them on the ground. Bees, hornets and wasps are very attracted to beer. They will go inside the can, drink beer, leaving them unable to fly. They will then drown in the remaining beer. Keep all wood areas around your house well-maintained. Stop the cycle of reproduction. You need to destroy not just the adult bees and females, but the larvae, too. Otherwise they’ll start breeding again. Keep an eye out for any new holes. Block them as soon as you find them. After the bees are gone, replace any damaged wood. Use pressure-treated wood for your outdoor furniture. Wear clothes that protect you when working around bees, so you don’t get stung. Don’t use pesticides that have been banned. They may harm you or other people, in addition to killing the carpenter bees. They can harm the environment, too. Previous articleWhat Does a Soft Cervix Mean? Next articleCan Pregnant Women Eat Shrimp?